Our experience over the years leads us to expect 25% to 35% new content and very little old content removed, maybe 5 – 10%. We will update you on this as more information becomes available. Beyond above list of topics, we should also expect CompTIA to, through added performance-based questions, add emphasis to the practical application of knowledge. Sub-objectives that start with “Given a scenario…” will be indicative of that type of questioning and we should expect to see more of those in the new A+ objectives. It all comes down to CompTIA’s push, over the last few years, to increasingly move from testing “knowledge” to measuring “understanding”. Should I take the A+ 220-901 now or wait for the new A+ 220-1001 exam? First and foremost you take the version available at the time you need to get certified, typically there is no good reason to wait around for a future version. The main reason for that is that no matter what A+ version you sit for, you will be just as certified for three years from the date of the exam irrespective of new vs “old”. Having said that, there will be a six months (or more) “grace period” between the introduction of the new A+ 220-1001 and the retirement of the A+ 220-901 during which you will actually be able to pick your preference in terms of exam objectives. What should then guide that choice? The short answer is: your training. If at that time you have been training for A+ 220-901, and are ready to pass the test, then without hesitation sit for the A+ 220-901. The training on 220-901 will not be transferable enough to succeed at the A+ 220-1001. That is because a 25 – 30% change in exam objectives will scuttle any chances to get an 85% or so score that is required to pass the exam. In this period your training will be the paramount consideration. If, on the other hand during this period, you have not specifically trained for 220-901, then take a long hard look at both exam objectives and just pick one you feel the most comfortable with. Again, it doesn’t matter if you happen to take the current version a day before its retirement date, you will remain certified and therefore, per CompTIA current, for three years no matter what. Another reason you may want to take the current version over the next one is that we often have a healthy tendency to prefer “the devil we know”… There is more predictability in committing to A+ 220-901. Can I still write Comptia A+ 220-901 after it’s retirement? You can sit for the A+ 901/902 until July of this year. After that, it won’t be available in the testing centers. If I study and pass the 901 exam, but have to take the 1002 exam instead of 902 will I still be certified CompTIA A+ or will I have to take both the new exams? Nope, CompTIA allows no mix and match. It has to be all A+ 90x or all A+ 100x. The good news is that you have till July to make it. However, if you have not started studying yet and so are not close to passing either, then we recommend you pick 1001/1002 as it will give you more time. Is the form of exam for 1001/1002 gonna changed? Will it be the same set as for 901/902? I heard that there will be performance – based questions mostly rather than what it is now for 901/902. Hi Waldemar, it is true that CompTIA tries to increase the number of performance-based questions for each release. However, in this case, the difference in numbers is small so it would probably not be considered an all-new form of the exam but rather an incremental kind of increase. I’m still currently studying 220-901 and have yet to start 220-902. If test centers will stop the availability from July 2019, I’m unsure if I will run out of time. Hi Liam, no there won’t be any type of “bridging certification”. If you are in doubt the best option is to resaddle and start studying the new A+ certification. Take whatever knowledge you have about A+ 901 and “convert” it to A+ 1001. About 70% of 901 content is still valid for A+ 1001. That way you don’t have to worry about making a deadline. Were you to pass A+ 901 in a couple of months and then not succeed at A+ 902 before the end of July, then you would have to start all over with A+ 1001 as there, by CompTIA rule, is no “mix and match”. 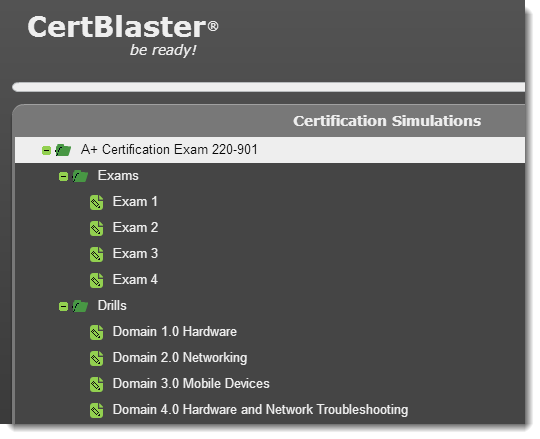 To get A+ certified its all 90x or all 100x. Best of luck! In a similar situation to some of the other people that commented–just started working on the 901. Would it be an unreasonable expectation of myself to think I could take the 901 and 902 before July, or should I just cut my losses and transition to studying for the 1001-1002? That question is tricky because the answer depends solely on your current level of knowledge on the A+ exam objectives. If you look through them and feel comfortable you know a fair amount of say half or so of them, then six months to bag both exams should indeed be quite reasonable a timeline. If on the other hand, you read through them and generally speaking have zero idea what 90% of them refer to, then it will be really tight. The problem with going for 901/902 if you are uncertain about the timeline is that it has a drop-dead deadline coming up. Were you to succeed at A+ 901 and say fail at 902 and let the deadline pass, then you just wasted all this effort on 901 and have to toss that and start over with A+ 220-1001. That’s because CompTIA does not allow “mix and match” between the two versions. A+ 901 & A+ 1002 won’t get you certified. Its all A+ 901/902 or A+ 1001/1002. If I am not able to pass 901 then will I be able to give 902 between that period or first I should pass 901 and then only can attempt 902? In this term I only have 901 and unfortunately I have 902 for next term . gotta confused if I move 902 also in this term and didn’t pass the exam 901 then will I be stuck there? Can I give second attempt after June/July , if I fail on 901 which I gave before June. Hi Mahi, you can attempt the exams in whichever order you prefer, CompTIA has no rules about an order. If you are in the USA, then you have to pass both exams before the end of July. That’s because CompTIA will retire the exam on July 31 (EOB) so after that, the A+ 220-901 and 220-902 exams will not even be available in the testing centers anymore. This makes July 31 a “do or die” type of deadline. If you are going for 901/902 then don’t take the last of the two at the very end of July. Plan on preferably no later than late June to give yourself time for a redo would you need one. Best of luck in your quest for A+ Certification!